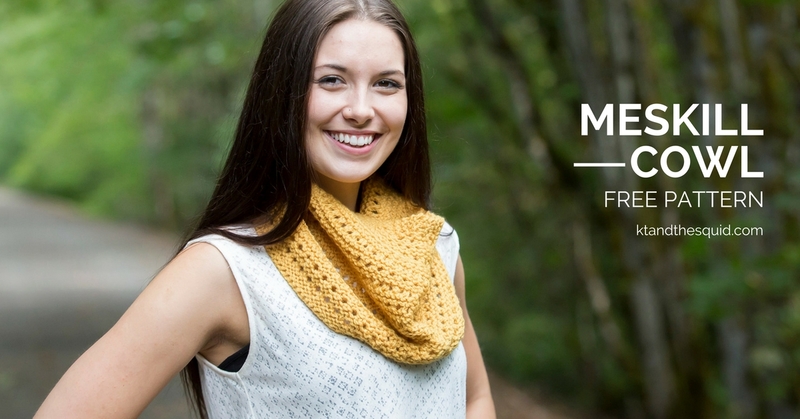 The Meskill Cowl is a cowl that is worked like a half circle shawl and then is joined in the round. It’s easy to wear and only takes 1 hank of Homestead by Plymouth Yarns. 25” opening at the top, 26” opening at the bottom and 11” tall at the front. This cowl is worked flat to make a half circle. Then it is worked in the round using the magic loop method. Row 5: K3, (yo, K2tog) to last 2, K2. Repeat rows 1-5 to desired length. Co 3, knit 6 rows, without turning pick up 3 sts along the garter edge, pick up 3 sts of the co edge. You will have 9 sts on your needle. Using the magic loop method you will now start working in the round. Round 2: (yo, K2tog) to last st, K.
Round 7: (yo, P2tog) to last st, P.
Repeat rounds 1-10 two more times. Bind off, block, weave in ends.